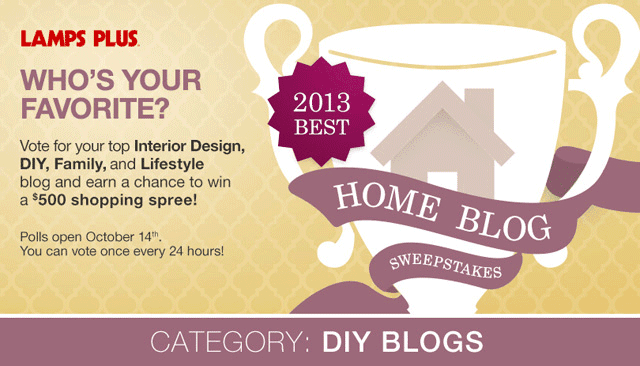 Before we talk about our guest bathroom, I want to remind you that voting in the Lamps Plus 2013 Best Home Blog awards ends tonight at 11:59 pm PT! You can cast your vote here for your chance to win $500! 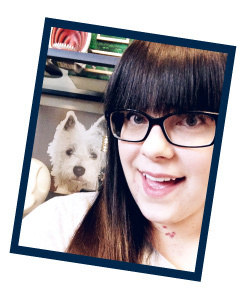 If you'd like to vote for me, I'm sweet #16 in the DIY drop down category! 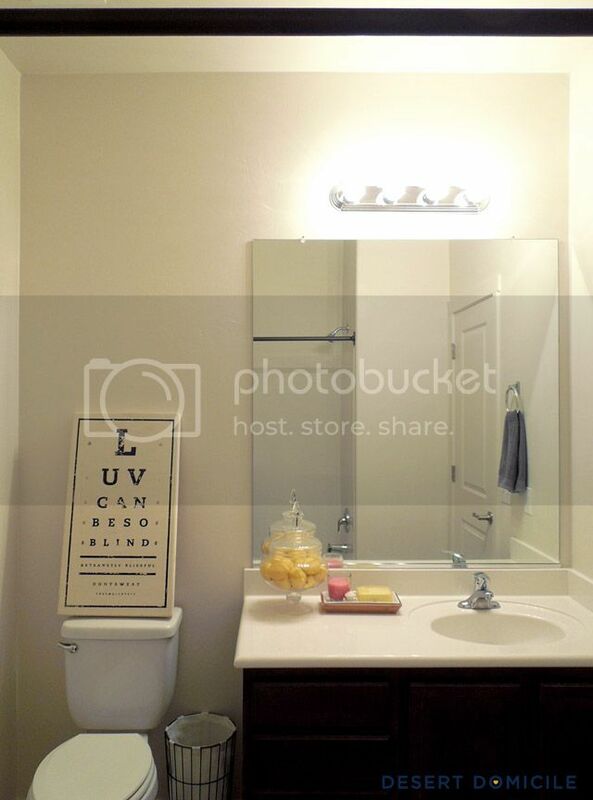 I keep going back and forth on whether or not to replace the big builder mirror. Currently I'm thinking of keeping it and framing it out. I have a fun frame idea in mind and am hoping it'll translate well into reality! 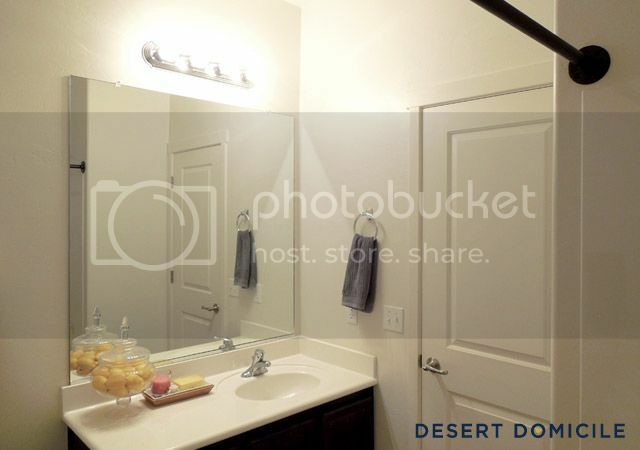 In a perfect, no budget world, I'd replace the mirror and then hire an electrician to remove the current light fixture and re-route the electricity so I could have two sconces added to either side of the new mirror. I'd also have my imaginary electrician add a ceiling light fixture so there'd be more light in the room. Maybe someday! 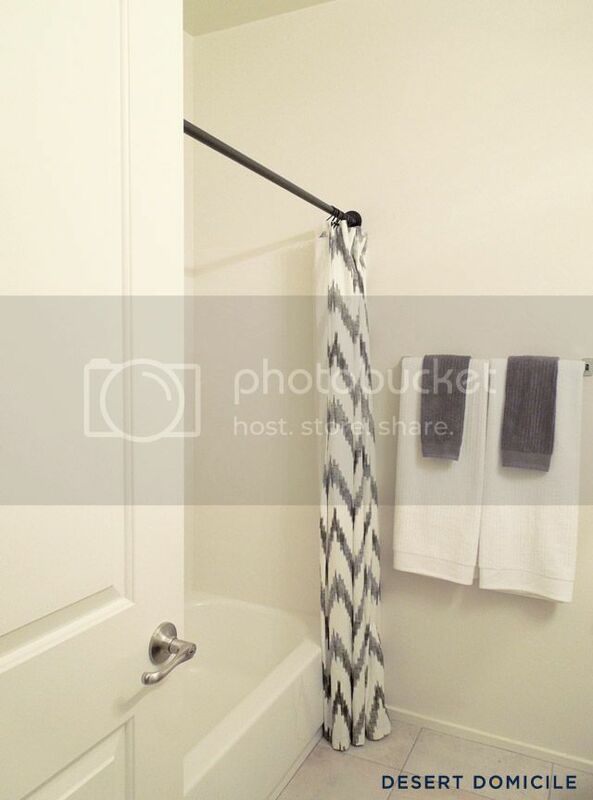 I plan on raising the height of the pipe shower curtain rod all the way to the ceiling and then buying a really long shower curtain and liner. 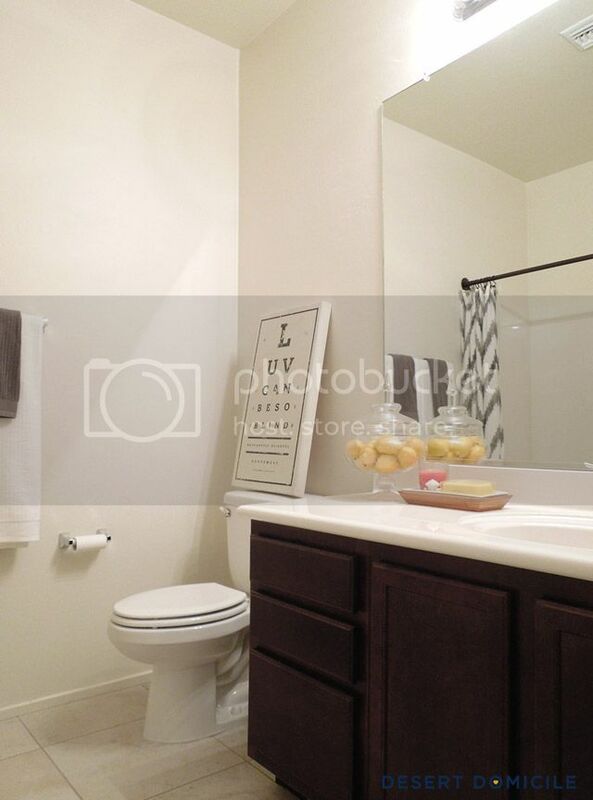 Maybe I'll hang something above the tub surround too! 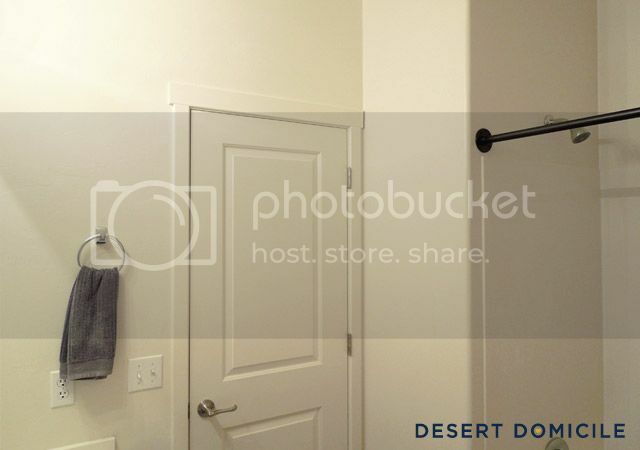 I plan on replacing the towel bar with towel hooks and getting a new toilet paper roll holder. I have a plan of attack in mind but I'd love to hear your thoughts on how you'd makeover the room! 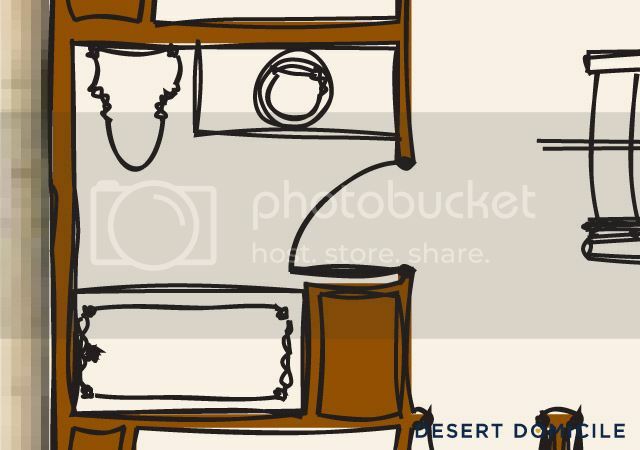 I love the idea of built ins and framing out the mirror! I'm working on my bathrooms now too and it can be so tricky to keep a small space like that open but also make it super interesting. Love the idea of the recessed shelves! That's the kind of thing that would never occur to me...actually using dead space :). 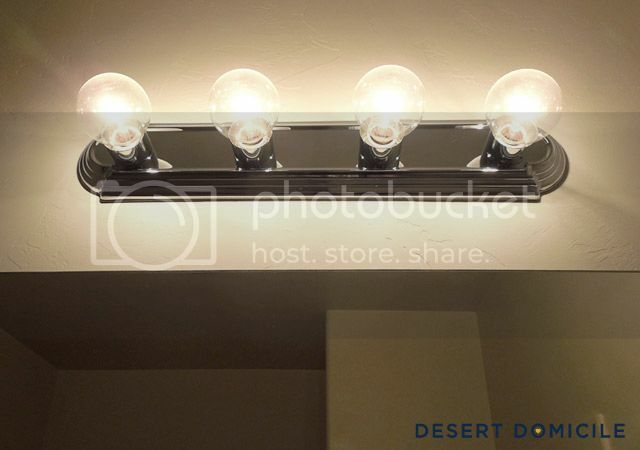 We have some of the same dilemmas in our master bath....I'd love to switch out the long vanity light for sconces, but it's not going to happen right now. I think we're spared the choice of whether to frame out the mirror by the fact that the mirror isn't in good shape, though. Excited to see it all come together! Thanks Gretchen! 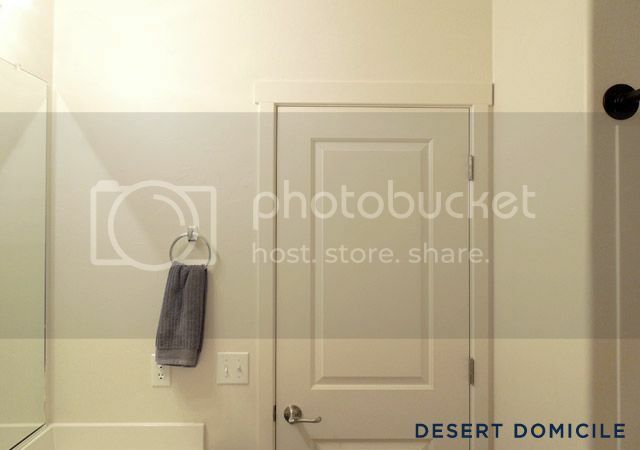 I'm 90% sure it's dead space based on what I remember our builder saying and some of the construction photos I have but I do believe there's a duct running along the left side of the wall. Only way to tell is to cut it open and see what we find! can't wait to see what you do- to me it already looks gorgeous! That curtain rod is awesome. Me likey. Sounds likes some awesome plans! 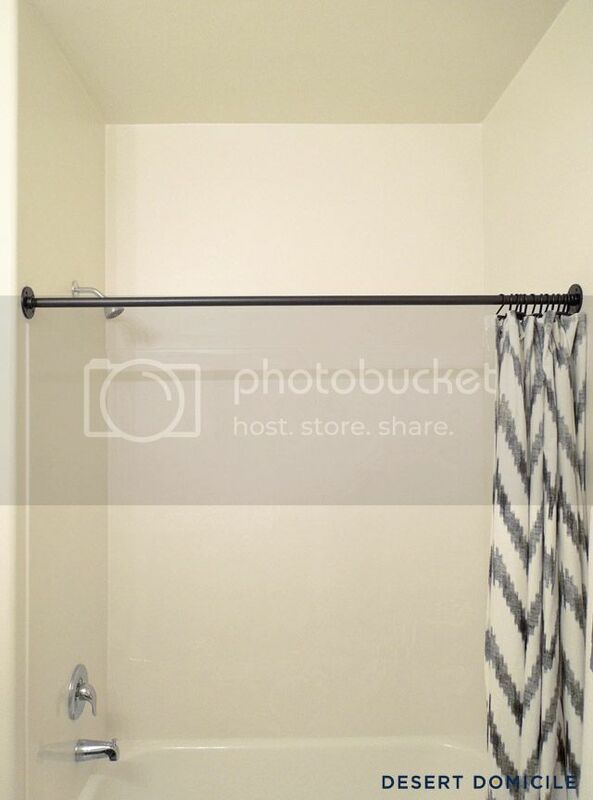 Any sources in mind for that long shower curtain? I'm in the market too and I can't seem to find what I'm looking for! Wow! I actually love how it looks now lol, but I think the changes will definitely make a difference. I hate our bathroom cabinets, the old, oak, cheap stuff and its not a pretty sight. I can't wait to redo ours one day! 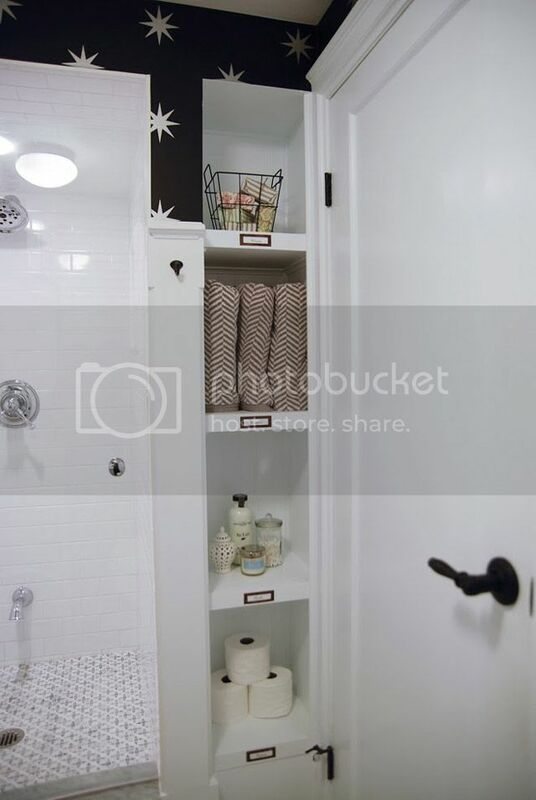 Love the shelving idea and high shower rod, looking forward to the after pics :-) P.S. I voted for you! It's funny, we just started demo on our basement bathroom that has the exact layout of yours except smaller--shower instead of bath. 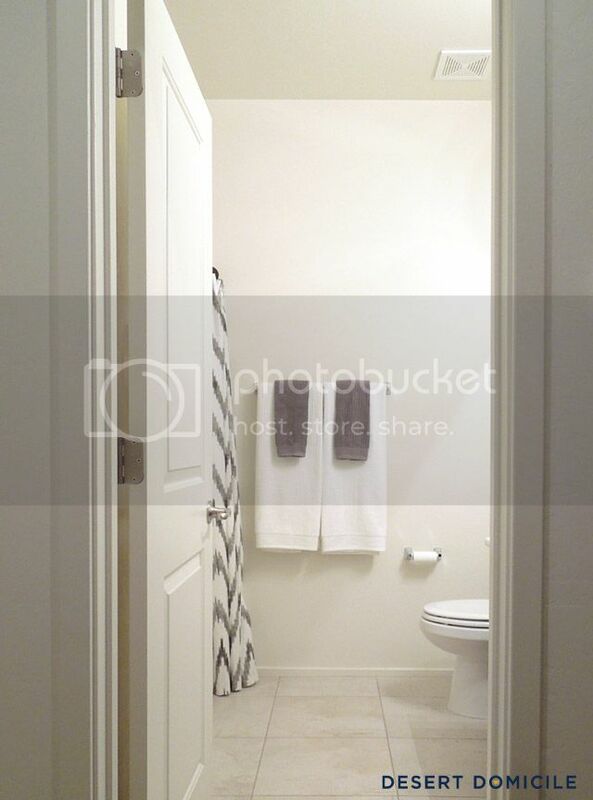 I just posted on our plans today, including our idea for the 'dead space', if you'd like to check it out: http://imgladiexist.blogspot.com/2013/11/surprise-bathroom-reno-current-and.html Love that curtain! I can't wait to see this room come together. 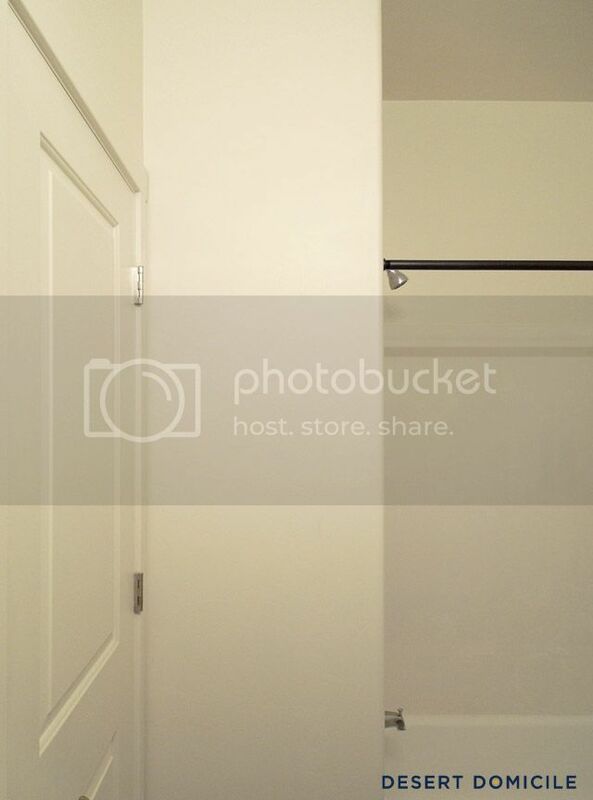 we had recessed shelves in our last home's bathroom and they were awesome. So handy to have the extra storage. Definitely frame out the mirror! I know you, and you have such a sharp design eye. 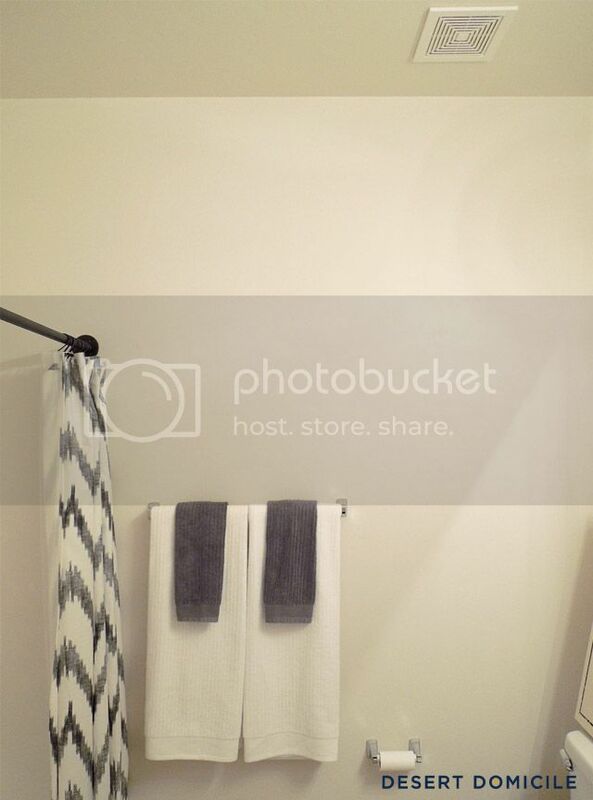 Your bathroom will look SO great. I need to tackle our hallway bath. It's pathetic. Really really bad. It's been screaming for attention. Please inspire me to get off my rear and do something about it. Ooh that's going to be amazing. I LOVE everything you do - your style is killer - so I'm pumped to see this play out!